A spiff is an immediate incentive fund or a bonus that is paid by a manufacturer or an employer to salesperson for selling a certain product. Similarly Boost Mobile or any other wireless service brand pays a certain amount of bonus to store owners like you, for selling their service. For example, for every activation done through Boost Mobile, Boost Mobile gives you $10 or 10% of it. The Spiff feature allows you to enter that information in CellSmart POS as a Spiff and categorizes them as pending spiffs, received spiffs, and voided spiffs. Note: Make sure you have created carrier plans to select them while setting up a spiff. For details regarding how to create a carrier plan and adding add-ons, click here. Click on the Admin Tools tab. Click on the Spiff icon. Click on the Manage button located on the top right corner. Click on the Blue plus icon located on the bottom right corner. Select your starting date by clicking on the drop down menu. Select a carrier by clicking on the Carrier drop down menu. Select the plan associated with the carrier by clicking on the Carrier drop down menu. Optional: You can include the add-on price to the spiff by checking the include add-on price option. Click on the Add spiff button. 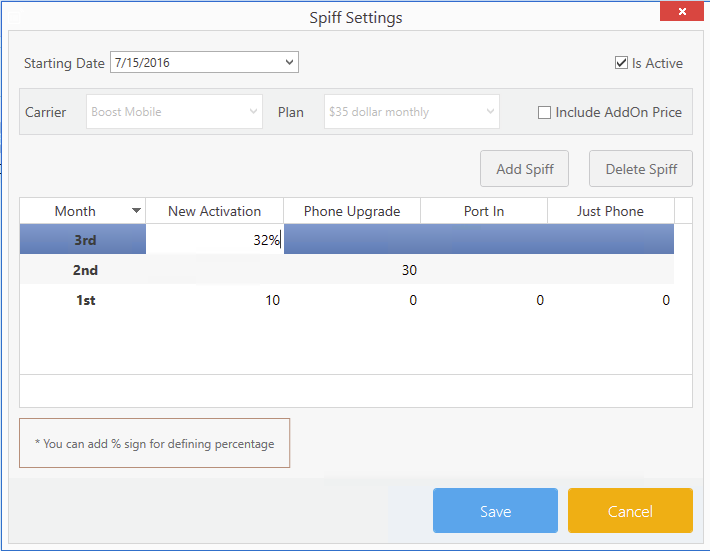 Depending on what kind of activation you're receiving the spiff on and, you can enter the spiff amount under New activation, Phone upgrade, Port in, or Just phone. You can enter the spiff amounts for the upcoming months as well by clicking on the Add Spiff button again which will add another month to the list. This way you can enter the spiff information for the upcoming months. In order to add a percentage amount in the spiff, you can enter the % sign next to the amount. How do I add a Spiff while doing an activation? Once you have created the spiff, the spiff is now linked to the carrier you select while doing an activation. There are no further steps to take to add the spiff to the activation. Note: These are the general steps to take for an activation which also apply when performing a spiff activation. Enter or Scan the IMEI number of the device you're selling in the item code field on the main Dashboard. Press Enter, and once the Activation window opens up, select the type of activation you're doing. Enter the phone number in the Phone number field if you have it with you, otherwise, you may enter that later. Select the carrier you added the spiff to by clicking on the Carrier drop down menu. Select the Carrier plan that was associated with the carrier by clicking on the Plan drop down menu. Optional: Select add-ons to add to the activation. Click save and the spiff will be added to the activation. How to do I make sure the Spiff was added to the activation? Under the Pending Spiffs tab, all the spiffs that are pending will be present and you can view the spiff that was added to the activation. Under the Pending Spiffs tab, select the spiff you want to mark as received by checking the Is Selected Checkbox. Once it is selected, the receive Spiff button at the bottom right corner will show the amount of the Spiff and you may click the recieve Spiff button to receive the spiff. Enter any necessary notes in the note box. Click Ok, and your spiff will be received. Once it is selected, the Void Spiff button at the bottom right corner will show the amount of the Spiff and you may click the Void Spiff button to void the spiff. Click Ok, and your spiff will be voided. Note: If the Spiff has been received and you wish to mark it as void afterwards, you may follow the same procedure but by going into the Received Spiff tab and then selecting the Spiff and clicking the Void Spiff button. Check the Show Deleted Spiff option from the options menu, to view all the deleted spiffs. Select the Carrier Spiff you want to edit from the list. Click on the Pencil icon from the options menu to edit the spiff. In the Spiff settings window, Make any necessary changes.